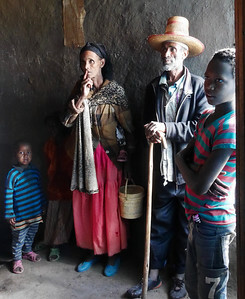 In November 2018, our friends Greg, Louisa, Bob, and Anita joined Rena and me for a 5-week trip to Ethiopia. For Bob and Anita it was a 2nd visit. They had traveled there in 1971 and had climbed Ras Dashen the highest peak (14,928 ft). In fact Anita was the first foreign women to climb it. After arriving in the capital, Addis Ababa, located in the center of the country, we flew to the North where we visited many historical and UNESCO sites. This Historical Circuit is what most tour companies offer. 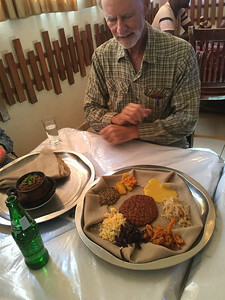 That part of the trip is described in a separate gallery “Ethiopia 1- Historical Circuit.” We also did a 5-day trek in the Tigray region, right at the northern border with Eritrea which is described in another gallery “Ethiopia 2- Tigray Trek”. This gallery describes our visit to the South. We traveled through the Riff Valley to the area along the Omo River near the border with Kenya to see colorful ethnic tribes. These tribes, all speaking different languages, have lived in a relatively small area (200 miles square) for hundreds of years. They have maintained their customs and traditions. 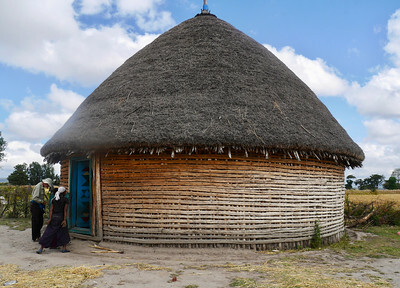 In recent years, modern advancements such as communication technology and large scale farming made possible by dams on the Omo River have had negative impacts on traditional ways. Tourism is helping keep the traditions alive since it is a needed source of income. We were lucky to see these people before more changes occur. Contact me if you want more information. 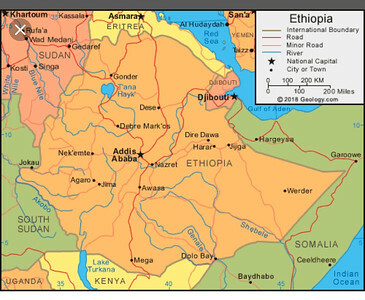 1 - Ethiopia is a high country. We spent 50% of our time above 8,000 feet and 95% above 5,000 feet. The climate is moderate being so close to the equator. 2 - Ethiopia is one of the oldest Christian civilizations in the world. The Ethiopian Orthodox church dates from the 4th Century. 3 - The country is about 40% Christian and 40% Muslim. 4 - The capital Addis Ababa is at an elevation of about 8,000 feet and has about 4 million people. 5 - It is the only country in Africa that was not colonized by a foreign power. 6 - It is the 12th most populous country in the world with 107 million people. 7 - The economy is dominated by agriculture, which is the primary activity of 80% of the workforce and accounts for 45% of GDP and 84% of exports. Most of the farming is done by hand with animals. We saw almost no tractors in the north. 8 - In 2017, Ethiopia had the fastest growing economy in the world. 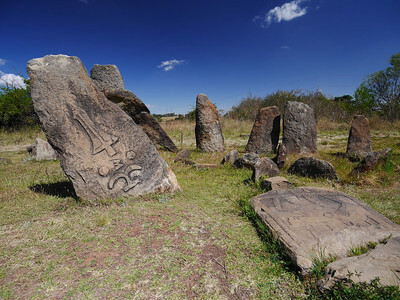 9 - There are 9 UNESCO World Heritage sites in Ethiopia. We saw 6 of them. 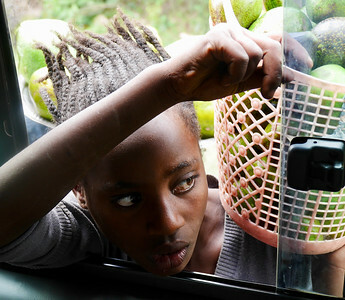 10 - The median wage earned in Ethiopia is about $178 per month or $2,140 per year. 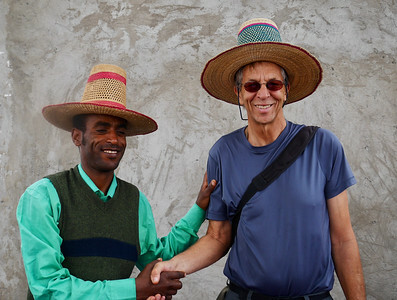 1 - The 5-day trek we did in Tigray was like a Nepal trek in a Southern Utah setting. Rena and I have done treks all over the world and this was as good as any. 2 - In the north, most homes are built out of rock with no glass for windows. 3 - Ethiopia is a safe country to visit as long as you stay away from some of the border areas (where tourists normally do not go). However, pickpockets in Addis Ababa are very prevalent and aggressive. 4 - Drivers are courteous, do not drive too fast, and are not aggressive. They rarely use their horns. It was safe to travel on the roads. 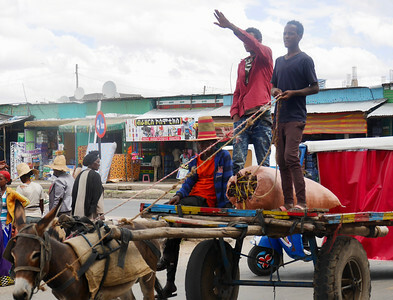 7- Ethiopia can be done on your own but some of the country, particular the South, is quite difficult without a guide. The Historical Circuit is much easier. Day - Date - Activity - Night? 34 - Dec 14 - 19 hour total flight time to get home. Arrive at noon on same day. Surrounded by Sudan, South Sudan, Kenya, Somalia, Djibouti, and Eritrea. 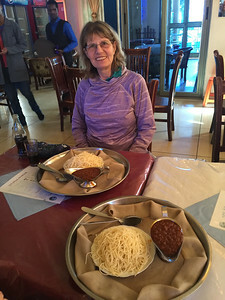 This restaurant served western food such as a spaghetti but assumed that you wanted to eat it with indura. 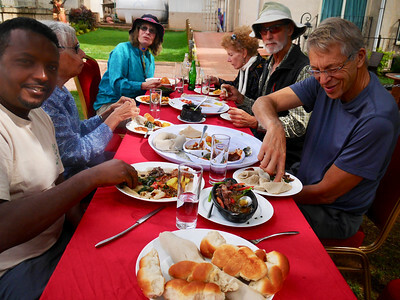 A big Lunch - Our guide Solomon is on the left. 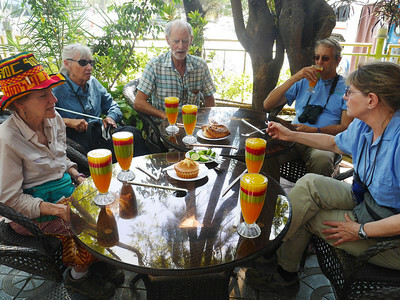 Fruit juices in Ethiopia are wonderful. 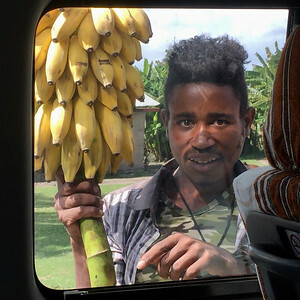 Fruit venders would come to the van when we stopped. Our hotels were very nice. 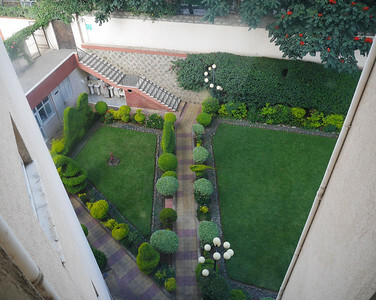 This is a view from our window at the Rediet Hotel in Butajiri. 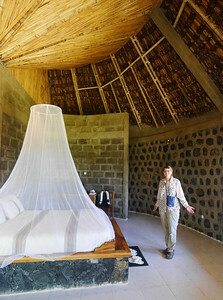 Mosquito netting was supplied at all the hotels in the South. 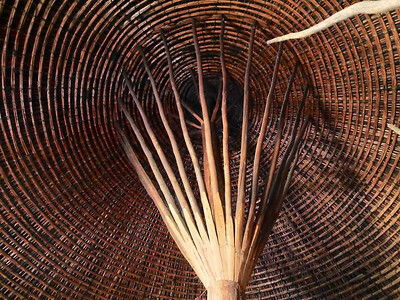 This is the Korebta Lodge in Konso. Great outdoor seating at one of the nicer places we stayed. 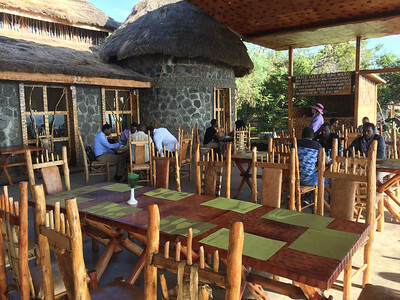 The Paradise Lodge in Arba Minch. 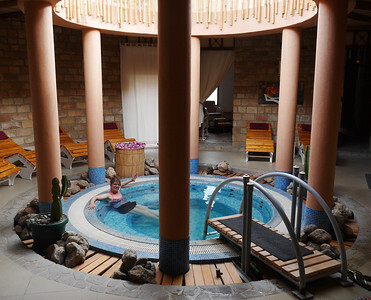 The Sabana Lodge at Lake Langano had a beautiful hot tub. 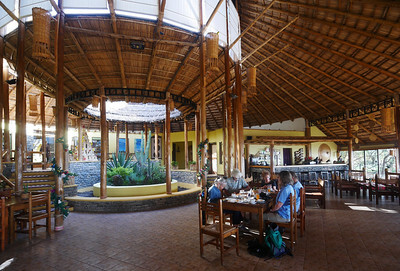 Breakfast at the Sabana Lodge. A few hours south of Addis Abba was the Tiya Stelie Field, a world heritage site, one of 6 that we saw. 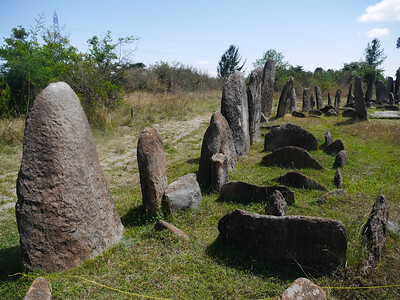 These monoliths are gravesites. The area has been excavated but little is known about the history. Lake Ara Sheton near Butajira. 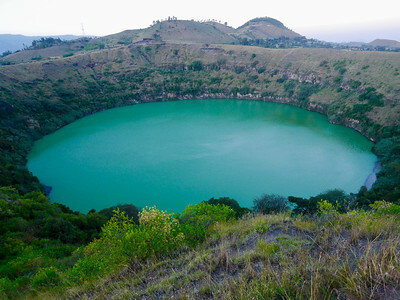 This is a volcanic crater. 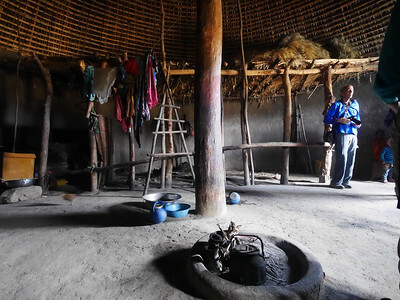 Driving from Butajira to Arba Minch, Solomon stopped and asked the owners of this Moslem home whether we could visit. The inside architecture was spectacular. 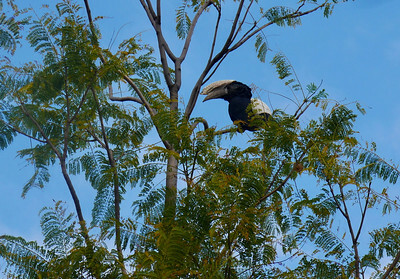 We saw several large hornbills.